Breaded, deep-fried pork needs no improvement -- except, perhaps, for its portability. Wrap some crustless white bread around it, and you’ve got yourself a perfect, filling snack known as a katsu sando. A popular convenience store staple in Japan, katsu sandos are rapidly becoming this year’s avocado toast at restaurants around the U.S.
You’ve likely eaten katsu before. You may know it as that dish your more unadventurous friends order whenever you “take them out for sushi.” While traditional katsu is typically a panko-breaded and deep-fried pork cutlet, you can make katsu with just about any protein, from chicken to beef to fish. Imagine that golden cutlet sandwiched between two pieces of fluffy shokupan, aka Japanese milk bread (a less processed, more tender version of Wonder Bread), with a few pieces of cabbage and the brownish-red tonkatsu sauce that kinda tastes like A1 -- and you’ve got the katsu sando. It’s a grab and go snack popular for picnics, quick lunches or late night eating and available at nearly every Japanese mini-mart. It’s kind of like their gas station taquito. There are a few types of “sandos” (cute slang for sandwich) you’ll find in Japan, including this fruit variety -- a glorious take on ambrosia salad in tea sandwich form. There’s also the tamago or (egg salad) sando. They’re all part of a subsection of Japanese food known as yōshoku cuisine. Yōshoku (literally “Western” fare) came during and after the turn-of-the-century Meiji period, which marked the end of feudal society and ushered in an era of Westernization in Japan. It was during this time that katsu itself originated, around 1899. That dish also of course drew inspiration from the west -- it was Japan’s take on wienerschnitzel or chicken Milanese. Yōshoku cuisine includes beloved dishes like the omurice (a fried rice stuffed omelette topped with demi glace or ketchup), which was interpreted by restaurants like Bar Moga in NYC in 2017, achieving brief, viral status. In fact, Bar Moga’s entire concept centers around yōshoku fare. (Curry rice, and Spaghetti Napolitan/Japanese ketchup spaghetti, are other yōshoku classics as well.) You’ll also find these dishes at newcomer, Davelle in the East Village. 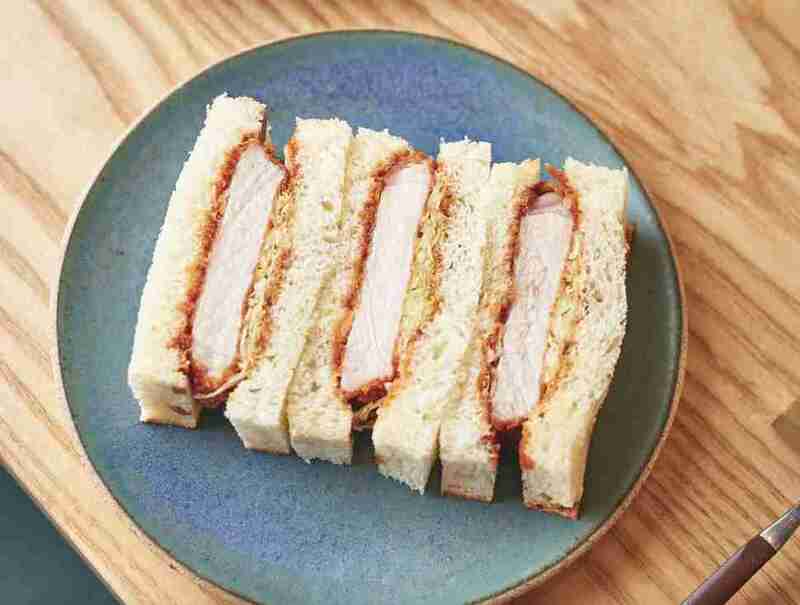 The humble katsu sando is the latest yōshoku dish to pop up in high-end restaurants and bars from LA to NY to London. The proliferation of a pricey wagyu katsu version on Instagram is likely the reason why. Chefs in Japan began using expensive cuts of wagyu beef to do a tongue-in-cheek homage to the sandwich for a few years now. While its exact origin is debatable, Sumibiyakiniku Nakahara in Tokyo was certainly one of the first to introduce the ritzy sando about five years ago. High-end wagyu supplier Wagyumafia is a bit newer, but has been doing worldwide pop-ups that also feature the uber rich sandwich made with their proprietary beef. Back in the states, chefs have caught wind of the trend and are offering up their own takes. Chef Daniel Son of LA’s Kura, launched a katsu sando pop-up inside his restaurant last year that became so popular, it’s now a standalone concept at LA’s Smorgsburg’s The Row pop-up. 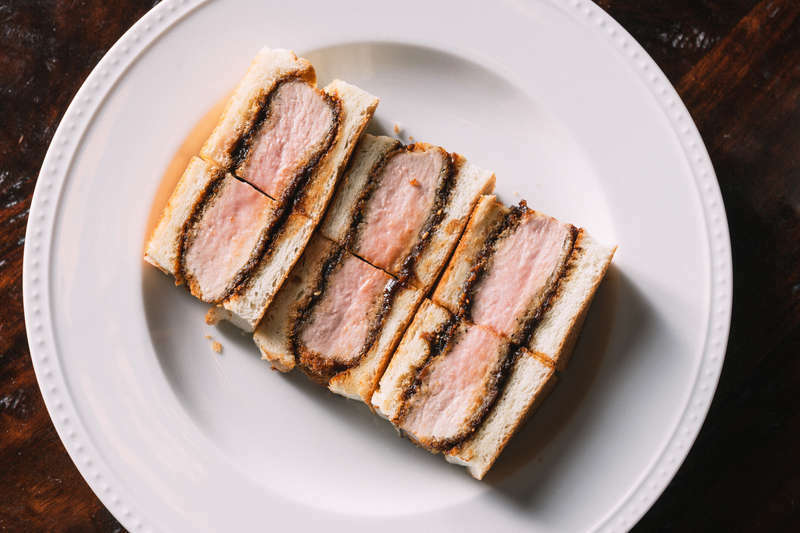 Son, who was raised in LA, fell in love with the katsu sando while he was working at Tokyo’s Michelin-starred Nihonrhoyi RyuGin. Hungry after work with limited options (at 4AM), he would often hit up the local mini-mart and feast on pre-packaged “conbini” fare (conbini = mini-mart). He’s currently looking for a brick-and-mortar space to house his concept, Katsu Sando, full time. Back in NYC, one of the first katsu sandos to gain popularity launched at izakaya SakaMai on the Lower East Side about a year ago. Their $85 wagyu version features A5 wagyu beef (which has been become the go-to variety for wagyu katsu). Don Wagyu, from the team behind spendy omakase spot Uchu, opened much more recently in June, raising eyebrows for their $180 version featuring Ozaki beef, a type of wagyu that almost no one else is sourcing here in the U.S., as well as two less pricey versions at $28 and $80. But other chefs are riffing on the less flashy OG version, mixing up the type of pork and other flavors to create a number of variations. 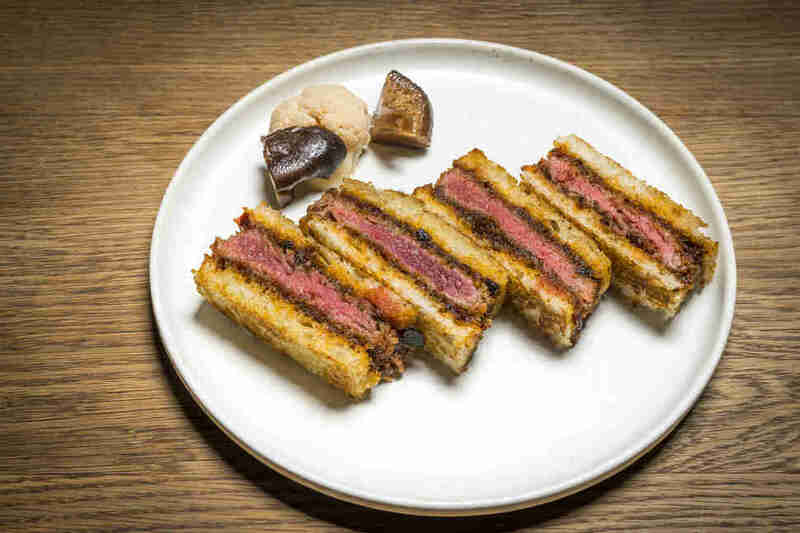 At Ferris in NYC, chef Greg Proechel’s take leans Spanish with the use of Iberico ham, combined with a shrimp paste and hoisin-based sauce. “Since I like to cook the pork medium rare, Iberico seemed like the best option,” he says. More Italian-leaning versions have sprouted up as well at both Momofuku Nishi and recent NYC newcomer Katana Kitten, where they use mortadella, a nod to chef Nick Sorrentino’s Italian heritage. But NYC is, for once, late to the game on this trend. It hit Sydney, Australia for example when restaurant Cafe Oratnek put one on the menu three years ago. It quickly spread around town and now sando-devoted concepts like Sando Bar and Sandoitichi are cashing in on its popularity. They also appeared in London as early as 2013 at spots like Tsuru and Tata Eatery. Currently, you’ll find a version at Brixton’s trendy “Japanese soul food” purveyor, Nanban. Single-item restaurants with limited menus have blown up in the UK post the 2008 recession, according to local food writer, Claire Coleman. You could say that in NYC, the single-item craze began slightly before then with places like S’Mac (mac and cheese concept) as early as 2006, Luke’s Lobster in 2009 and later, The Meatball Shop in 2010. Most of the katsu sando you’ll find in NYC right now are part of larger restaurant concepts, vs a single item concept like LA’s Katsu Sando. Elsewhere in the U.S., the trend is slowly catching on as well. You’ll find katsu sandos in places like Atlanta’s counter service Japanese spot, Momonoki. In Seattle, a faithful representation at Adana and one slightly less so at Marination (served on ciabatta). In San Francisco, you’ll find versions at casual takeout spot Volcano Curry and at Stonemill Matcha. In DC, this $100 version (which takes many creative liberties) made a small splash at Michael Mina joint, Bourbon Steak. Besides being delicious, the real reason for their popularity is likely pretty simple: they are photogenic AF. When served inside facing up, the pretty architectural layers of pork, sauce and bread make for a highly Instagrammable dish. Whether you’re eating one of these bougie versions for bragging rights, ‘gram likes, or just unabashed curiosity, know that somewhere across the ocean there’s a $5 version wrapped in plastic making a tired, drunk person equally as happy. Kelly Dobkin is a writer/editor, culinary school grad, and recovering waitress based in Brooklyn, New York. Her interests include pina coladas (check out @piningforpinas), cats, pizza, and sushi she can not afford. Follow her on Twitter and Instagram.